Thinking of renovating the kitchen of your heritage Toronto home in the spring? With the new year approaching, we’re bringing together inspiration so that your 2019 kitchen renovation is not only the right fit for your old Toronto home, but also modern and fashionable. 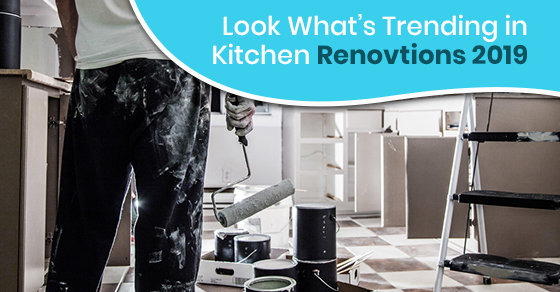 To get those ideas flowing, here are some of the top trends we’re anticipating for kitchen renovations moving into 2019. Forget stainless steel, matte is back! As 2019 approaches, the time of trendy stainless steel appliances in the kitchen has come and gone. Recent trends show that a dark matte finish, similar to those sleek, modern supercars, is in demand. This should come as no surprise as here at Avonlea, we understand matte appliances not only complement most kitchen materials, but also reduce the look of fingerprints and grime collected through daily life. For something used as frequently as the refrigerator, this makes a huge difference in keeping your kitchen area as clean and presentable like the rest of your home. In recent years, we’ve begun to embrace the idea that less is more. How does this translate to the kitchen? It translates quite simply, pun intended. We’re starting to see a lot more kitchens clear of clutter today, and we don’t just mean hiding the appliances from the countertops, though that is a part of it. Minimalism encourages removing unnecessary bulk such as upper cabinetry, moulding and heavy finishes. This gives the kitchen a clean and contemporary look to fit the popular minimalistic lifestyle of today. To bring out the personality in your kitchen, look no further than a unique sink. Though we use it so frequently, we don’t often imagine the possibilities that could arise when it comes to choosing the right sink. In 2019 we’re seeing the boring, old kitchen sink grow into something extraordinary. Don’t be shy and explore all of your sink options; you may find yourself falling for some options such as embossed sinks with metallic accents, hammered finishes, or intricate details and gold. Sinks don’t end there though – there are more options coming out that utilize the area above and around it. There are options for removable cutting boards to maximize counter space, integrated coasters and pot holders, or even ice buckets! At the end of the day, we aren’t expecting to see any more of the bleak white kitchens that remained popular for so long. The whites and greys are being replaced with blacks and golds; the granite is being replaced with organics like raw wood. We’re seeing more bright colours to make your kitchen features pop, bringing in joy and brightening the room. If you’re looking for a colour palette to inspire, today’s kitchen decor often takes from darker blues, greens, and olive tones. For information about how Avonlea Kitchen Renovations can make your 2019 design dreams a reality, give us a call at (416) 907 4764 or contact us here.